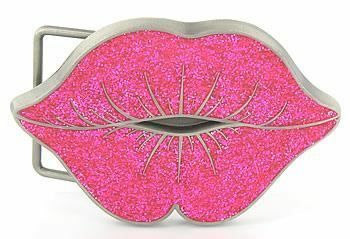 GLITTER KISSING LIPS - Pucker up Belt Buckle Amazing 3 Dimensional Detailed Buckle Design at wholesale prices. Fits Belts up to 1.5" wide This Buckle Measures 3.75" wide and 2.5" tall. Picture shows Pink, but these are now made in Red Glitter.